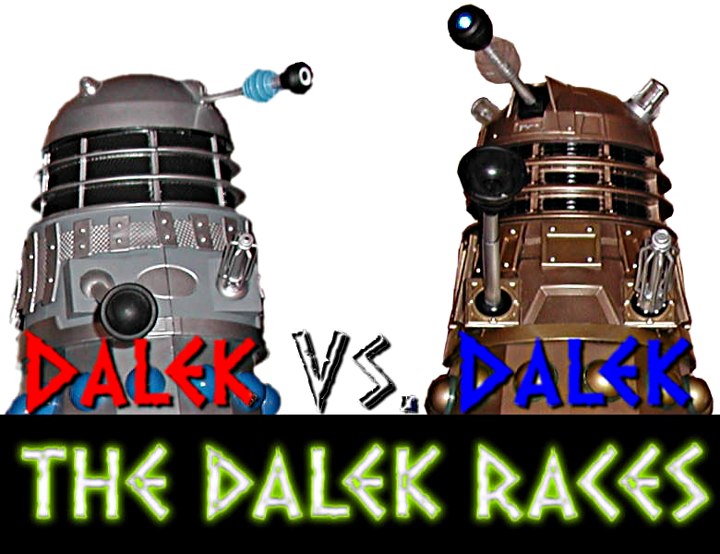 Welcome again to the Skaro Speed Trials! 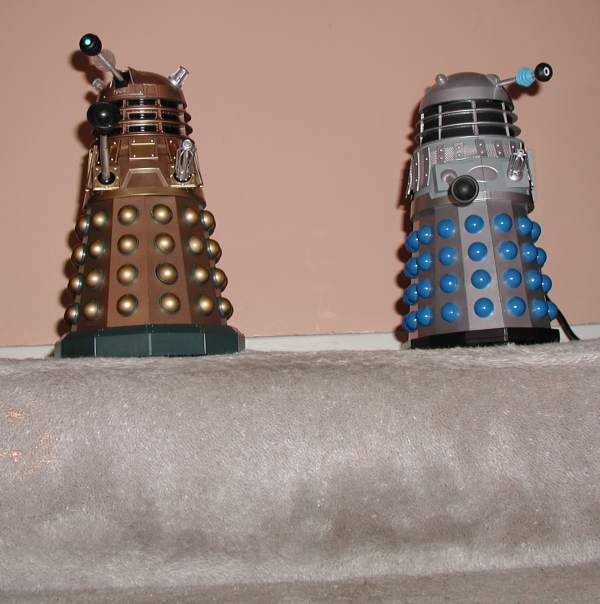 Last year saw the Master put on trial against Dezmond T Dalek, with hilarious consequences. Will we ever see the implosive like of that again? Well, this year might just top even that! Last year's winner, Dezmond, is up against new challenger, Wayne Dalek, who is sporting the new 'bling-mobile' casing. Can Dezmond's old reliable tech beat out this newcomer? 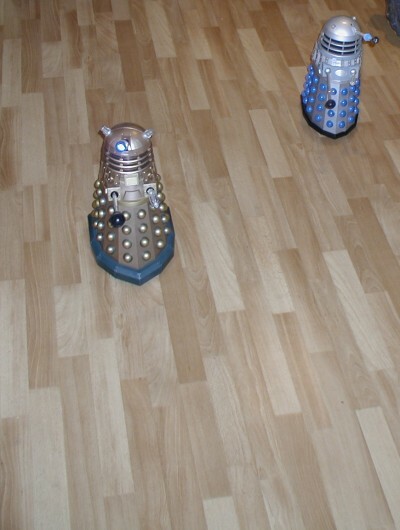 Millions of Daleks out there must be perched on the corner of their travel machines in anticipation, we certainly are. The first race is a straight sprint. As with all the events this year, all exterminations have been banned, so sadly we won't see a repeat of the mass carnage of two years ago. Just why a delegation of Thals thought it safe to spectate that year is anyone's guess. Anyway, it looks like they are about to start... Yes, they're off! What's this?! Dezmond has barged Wayne. Yes, there is quite an altercation down on the finishing line now. 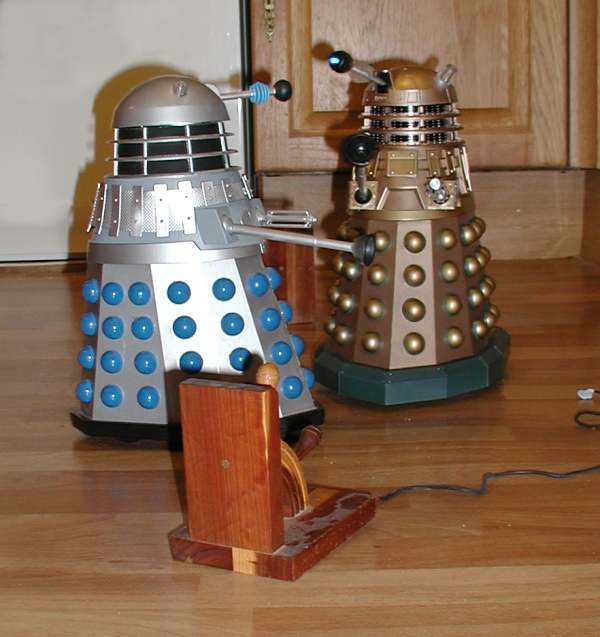 The Dalek judges are waving some menacing cylinders at the two contestants. That's calming them down - neither wants a dose of the Movellan virus! And who can blame them - that stuff gives burning itching sensations in the worst of places! Next up is the Obstacle Course. This event replaces last years Assault Course. As they are not allowed to actually assault anyone this time, they must instead each navigate around a series of objects. The course itself is not marked, so they must first commit the course to memory. Any deviations from the course, or crashing into the obstacles, will incur time penalties. Dezmond has come in last again! The judges are totalling up the points and it's looking like a close run thing after Wayne's missing of a waypoint. The judges have awarded it to the defending champion - Dezmond! 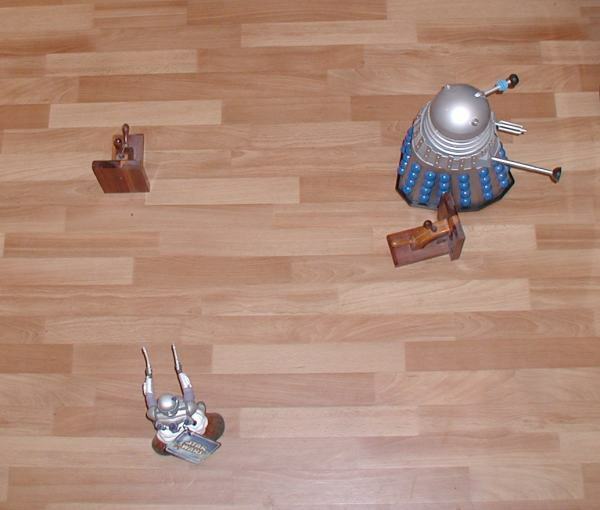 I've never seen a crowd of spectating Daleks doing Mexican Waves, until now! Dezmond is certainly popular down here today! They are both doing surprisingly well! The crowd are cheering 'exterminate!' in appreciation. They may have had trouble getting onto the carpet but once on there they are trundling on nicely! Wayne is creating a slow but steady lead, however. Yes, Wayne has it again. 2-1 to Wayne. Now it is the ultimate challenge! The stairs! Down they must go, the first one to reach the bottom without falling will win this event. Can Dezmond bring it up to a draw? 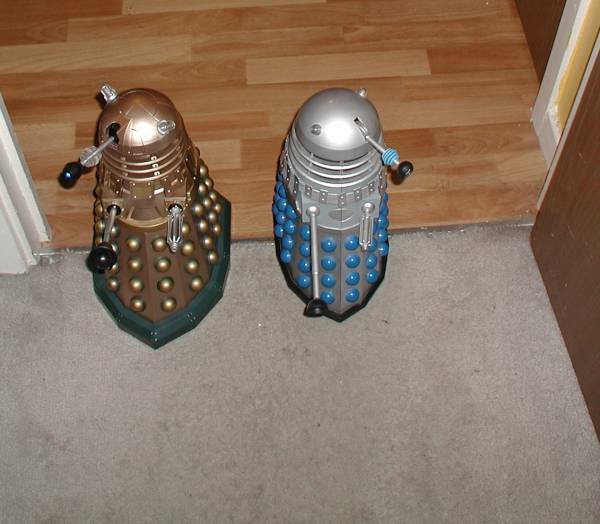 The twitching of their weapons shows you just how nervous both these Daleks are. I wouldn't like to be in their casings right now. As we await the starting explosion you could cut the atmosphere with a Dalek Death Ray! There it is! They're off! Well, there we have it. 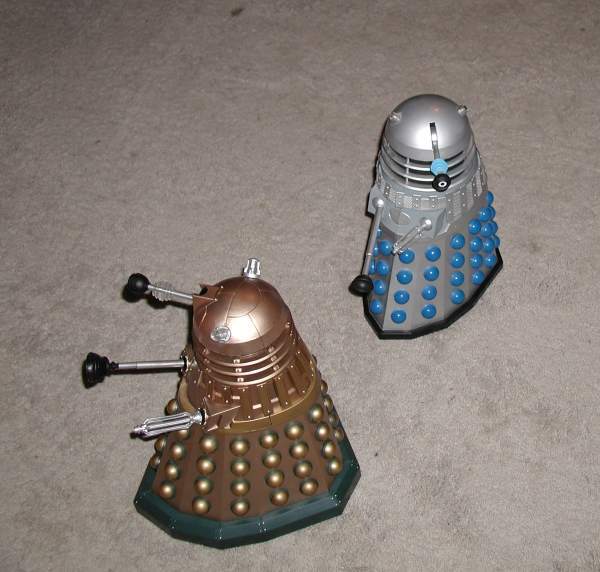 Wayne, and his new bling casing, has won this years Dalek Races! His reward? He will be sent to the front line of the Time War! 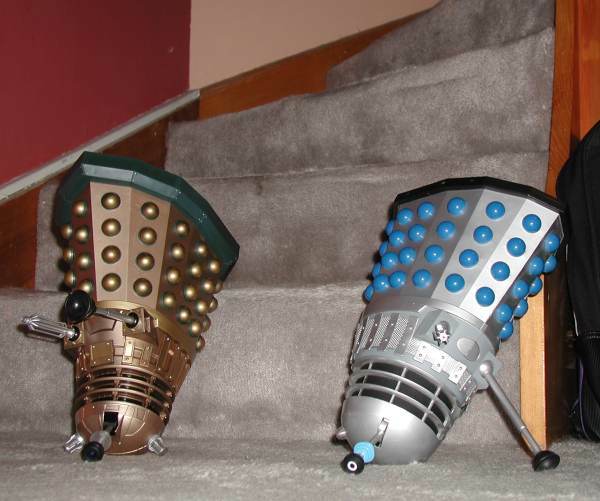 The lucky Dalek!